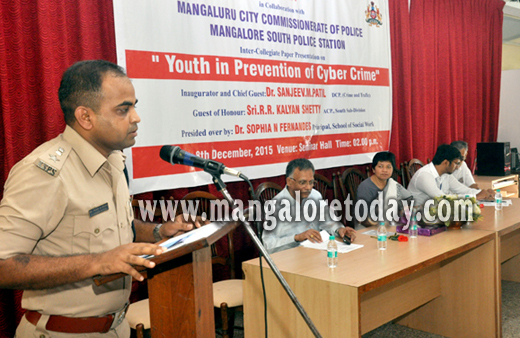 Mangaluru, Dec 9, 2015 : DCP (Law and Order) Dr Sanjeev M Patil has exhorted youngsters to refrain from forwarding provocative content on social networking sites. He was speaking at the inaugural function of an inter-collegiate paper presentation competition on ’Youth in Prevention of Cyber Crime’ at the School of Social Work, Roshni Nilaya on December 8, Tuesday. Continuing, the DCP said such acts can very well land the students in prison for different offences and urged them to try to inform the nearest police station about such content. Speaking about cyber crime, he said as much Rs 29 lakh crore is spent across the world to tackle cyber crime which is on the rise in the recent past. He also urged people to be cautious while making online shopping using ATM card. Presiding over the function, Dr Lakshminarayan Bhat P, Registrar of Roshni Nilaya said youth need to be very cautious while posting anything on social sites. Dinaker Shetty, SI of Mangaluru South Police Station, Dr Jacintha, former principal of the College and others were present. Research papers on cyber crime were presented by students from various colleges.